In April 2009, the 1.2 million sq. 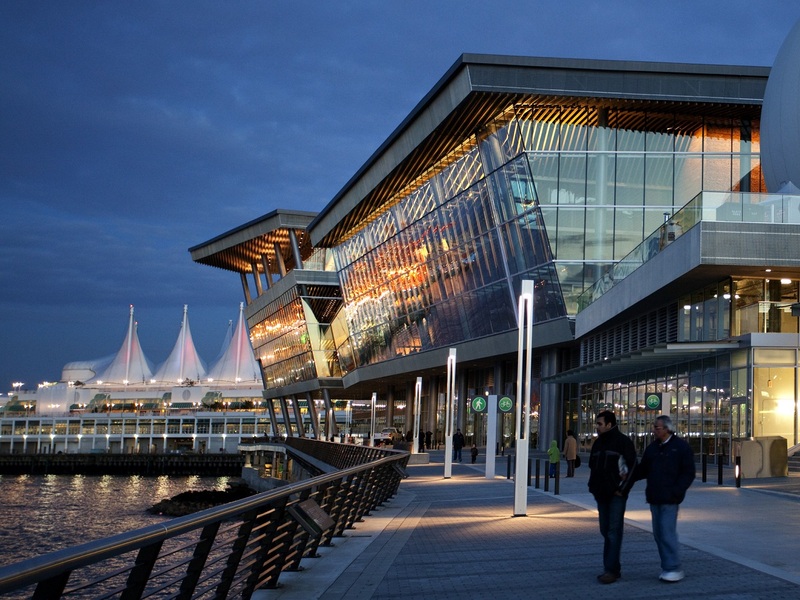 ft. Vancouver Convention Centre opened. 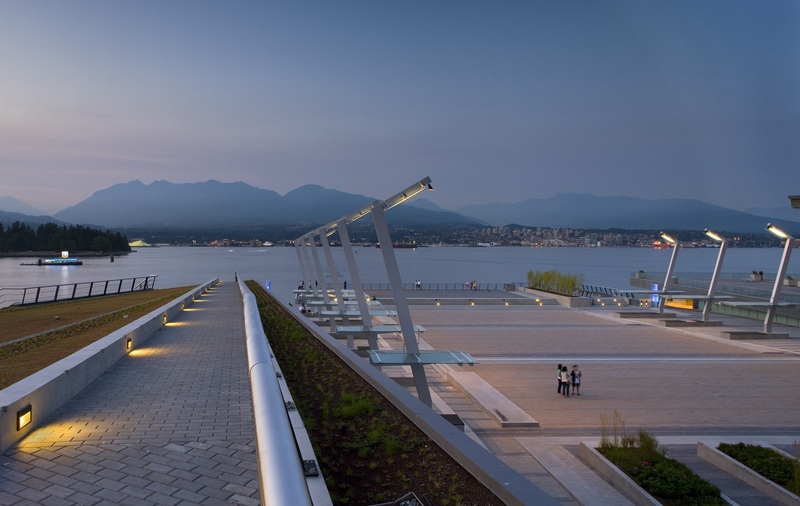 Built upon a former brownfield that was the last undeveloped piece of property on the harbor front, it functions as an expansion of Canada Place. 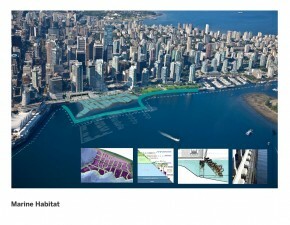 The facility covers 14 acres of land and eight acres of water, and is connected to Canada Place via landside walkways. 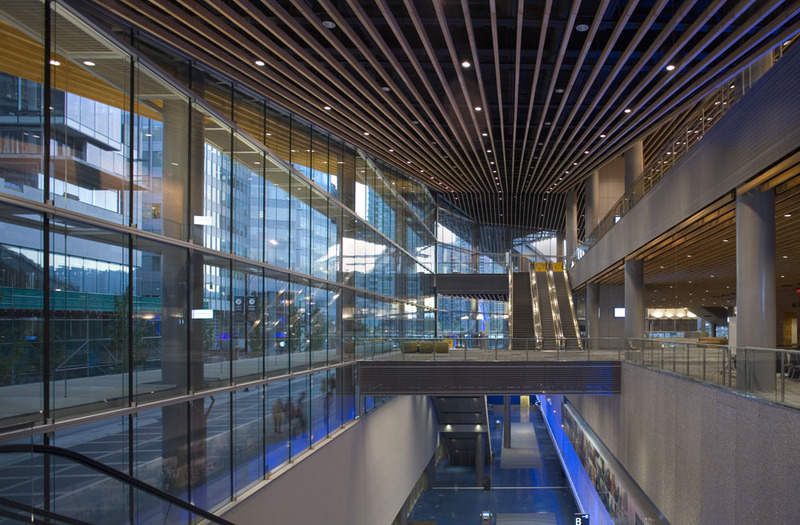 It was designed by Seattle-based LMN Architects, in collaboration with Musson Cattell Mackey Partnership and DA Architects + Planners, both of Vancouver. Building Area: 1.2 million s.f. Civil Engineer: Sandwell Engineering Inc.
Electrical Engineer: Schenke/Bawol Engineering Ltd. Structural Engineer: Glotman Simpson Consulting Engineers and Earth Tech (Canada) Inc.
Environmental Consultant: EBA Engineering Consultants Ltd. The designers’ solution was to create a built form that is integrated into both the landside environment and the landforms surrounding it. 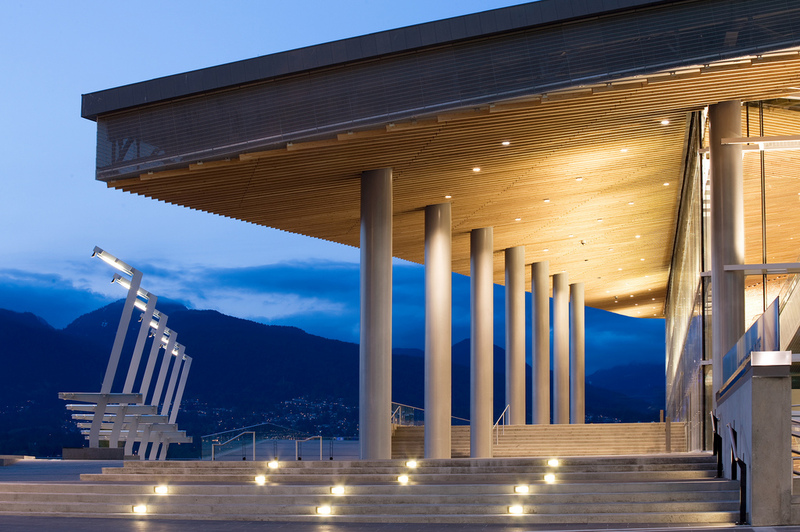 The Convention Centre acts as an extension of the existing waterfront park, and establishes view corridors from the downtown core onward to nearby Stanley Park, the harbor, and the mountains beyond. 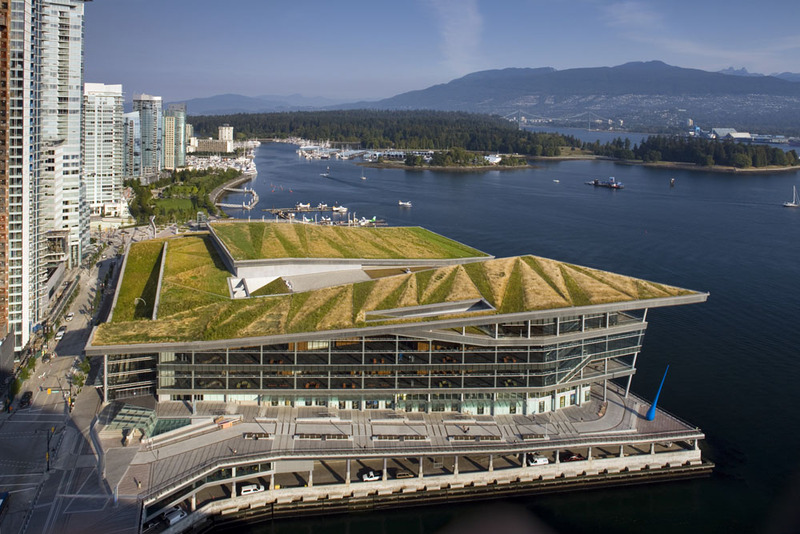 From inside the building, views are framed of downtown Vancouver; the Convention Centre’s green roof, in turn, enhances the view from the surrounding skyscrapers. 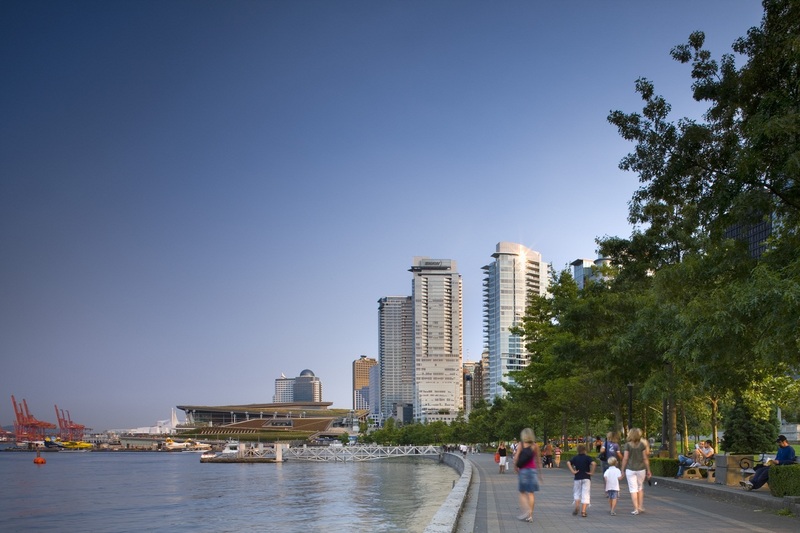 Vancouver, more than many places, has had to come up with inventive ways to serve its local community; since the city is on a peninsula, its growth is severely constrained. According to one source, the population of the downtown core more than quadrupled between 1981 and 2001. 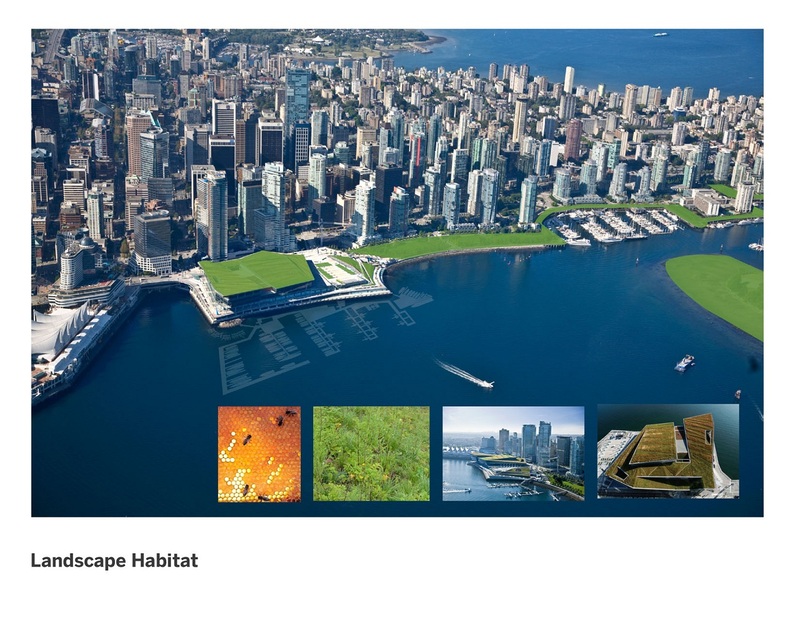 Fortunately, Vancouver was an early adopter of high-density planning practices, and since the 1980’s its city council has assertively promoted a “Living First” strategy, changing zoning to allow for more residential development. Having such a large population living downtown places special demands upon every developed square foot of space, and every built form is called upon to serve multiple functions. The Convention Centre lives up to these special demands. 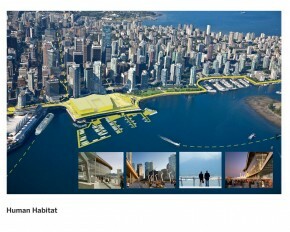 According to the architects, it triples the total square footage of the public realm on the waterfront. For additional information on the Convention Centre LEED certification and green operating practices download the following. 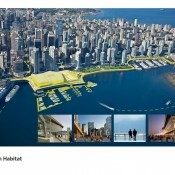 Lindsay Cole, director of Sustainability Solutions Group of Canada, was the LEED consultant for the Convention Centre project. 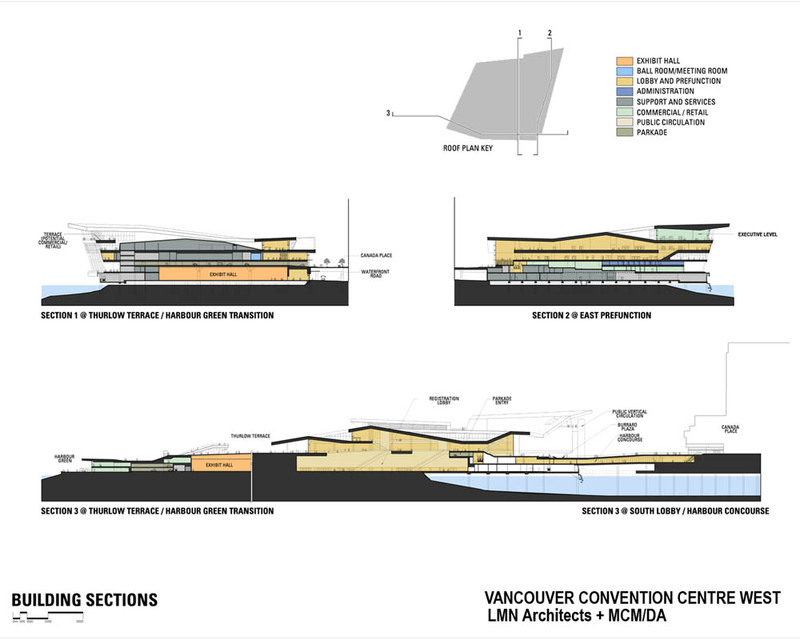 As such, she was a participant in many changes and improvements that occurred over the duration of the project, from the advancement of the owner's original sustainability intentions to the way that the Convention Centre operators did their own research and pushed LEED plans further. 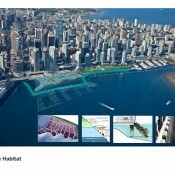 One thing that made this project unique was the level of involvement of the local professional community; during the design process, a team of Vancouver architects and engineers were invited to form an impartial panel of experts/reviewers/judges so they could give their own input into the particulars of the design. 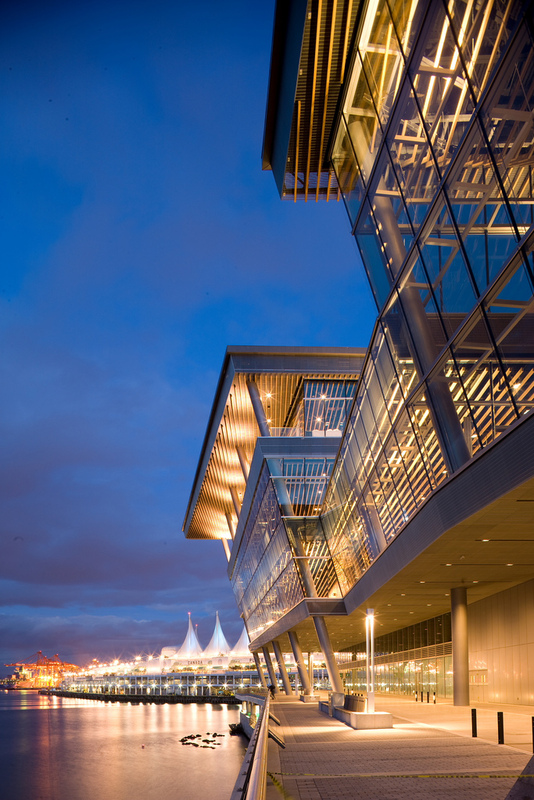 Stantec Consulting represented the owner, BC Pavilion Corporation (PavCo), and their goal for the building was LEED Gold. 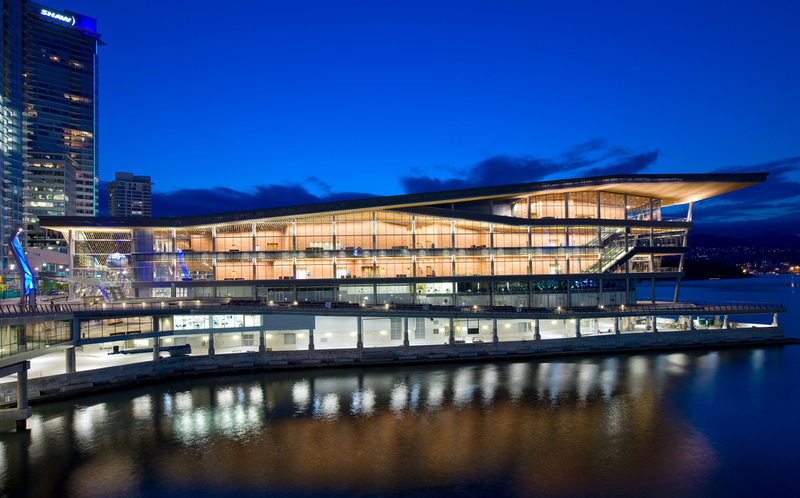 It was determined that the building needed a new mechanical system, rather than modifying the one from the existing convention centre to draw air into the new addition. It was, in large part, the new mechanical system that ushered the design into the realm of LEED Platinum. 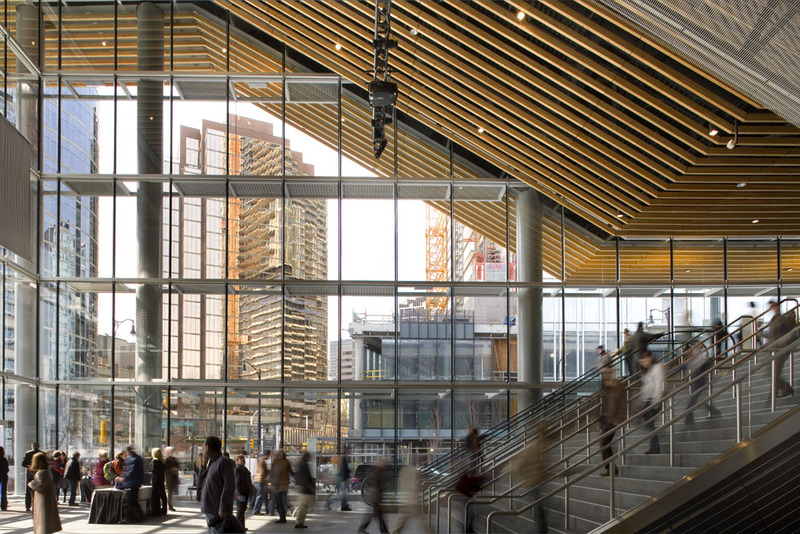 BC Pavilion Corporation was notified that the Canada Green Building Council (CaGBC), a sister organization to the U.S. Green Building Council (USGBC), had granted the Convention Centre LEED Platinum Certification (52 points total) in February 2010, just one day after Lindsay Cole and Jacques Beaudreault were interviewed for this case study. "The energy modeling done for the HVAC system by the engineers ended up being much more conservatively figured than what was the case after installation and testing its efficiency," said Cole; this was the main reason the building was pushed from the Gold to the Platinum level. A portion of the certification fees are returned to a building’s owner when a building is granted LEED Platinum status. 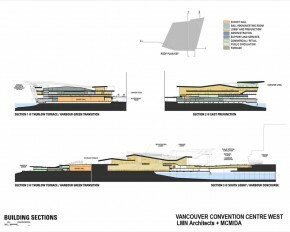 According to Cole, the operators of the existing Convention Centre (which is located adjacent to the new building) had been following rigid green practices for the past 10-15 years before plans were assembled for the new LEED building. "So they were a great help to us on the project," explained Cole. "They were interested in making sure the new building followed a green cleaning system, sustainable waste management practices, the promotion of green transportation methods, sophisticated mechanical energy system computer programs and controls, and overall green operations management practices." After the Olympics ceremonies, the operators were already preparing their work staff to continuously measure and verify that the systems in the building were working as they were designed to do, and to ensure that the systems were properly maintained. "They really saw the value in making these extra efforts. To them a lot of being green is in their cleaning methods, as well as in the way they feed the people who use the building," said Cole. 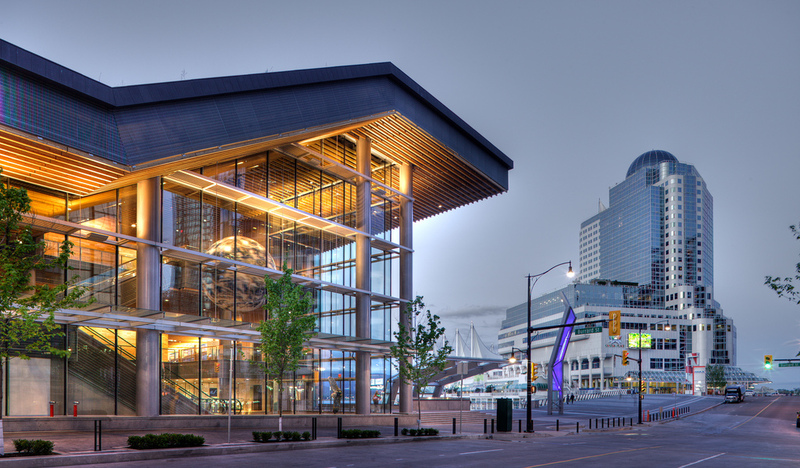 "They were the heart behind the project because they wanted to keep their convention centre as sustainable as possible." 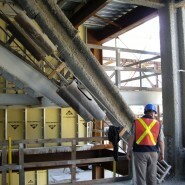 For the operators' efforts, the project also garnered another LEED point for Durability. 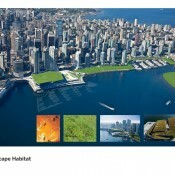 This particular point is not available within the USGBC rating systems yet, but the CaGBC awards it when a plan is proven to “minimize materials use and construction waste over a building’s life resulting from premature failure of the building and its constituent components and assemblies” (p. 65 of the LEED Green Building Rating System). "This point really is the result of the operators showing their plans for the building," said Cole. 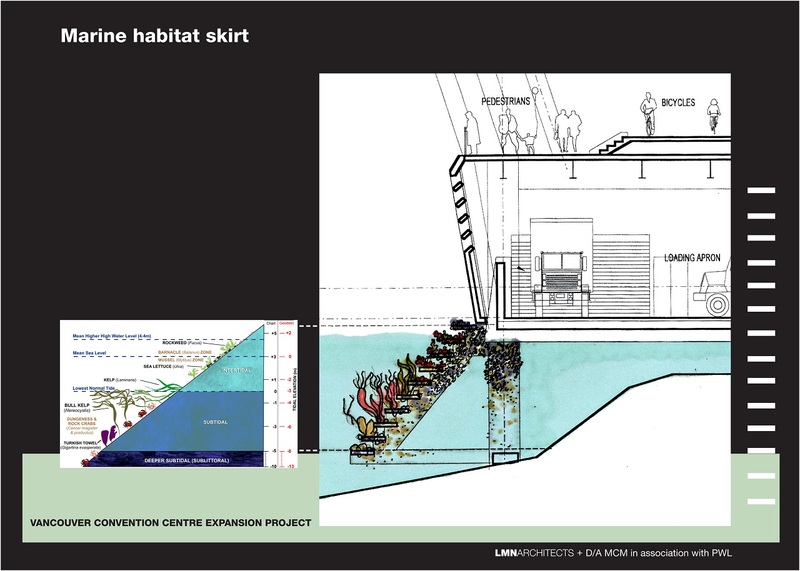 Aside from the remarkably energy efficient mechanical systems in the building, one of the project's most innovative aspects was the creation of a seawall that doubled as an artificially made marine habitat wall. 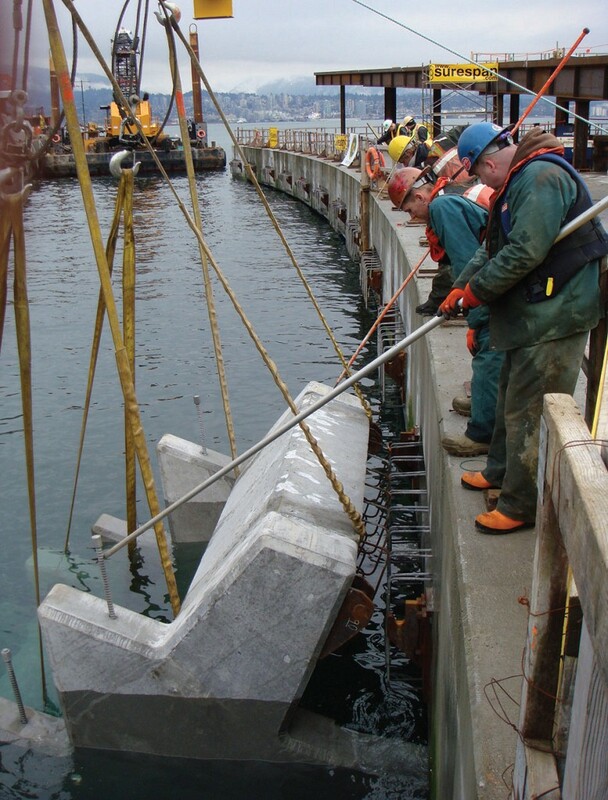 Typically when buildings are constructed on, over, or near oceanic habitats, a seawall must first be built to protect the natural wildlife. 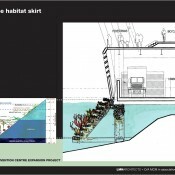 Since two-thirds of the building's foundation stretches out over the ocean, the federal fisheries issued requirements to the construction team to make sure the project was managed to protect the marine habitat. The design team decided to take the federal requirements one step further, in order to not only protect the natural habitat, but to also help promote its reestablishment in the area. 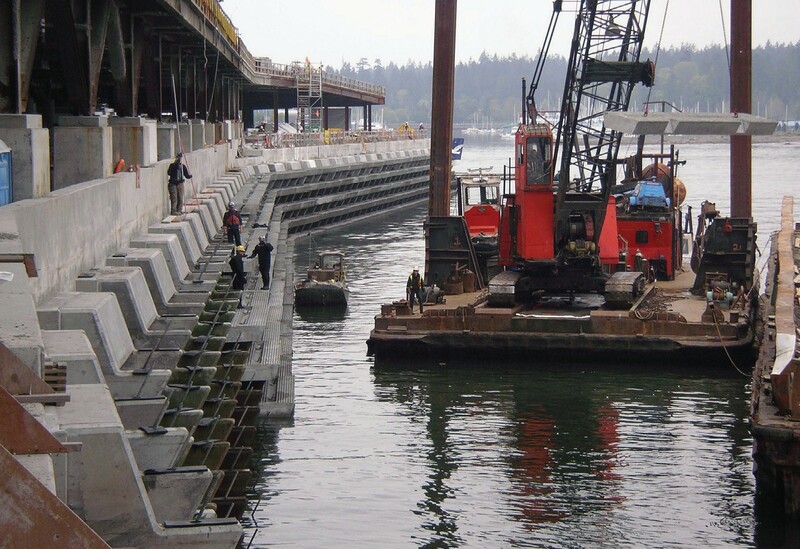 Therefore, the seawall was designed to cultivate the growth of new habitats upon the seawall's stepped surface. "We started calling the seawall a habitat shelf instead," explains Cole. 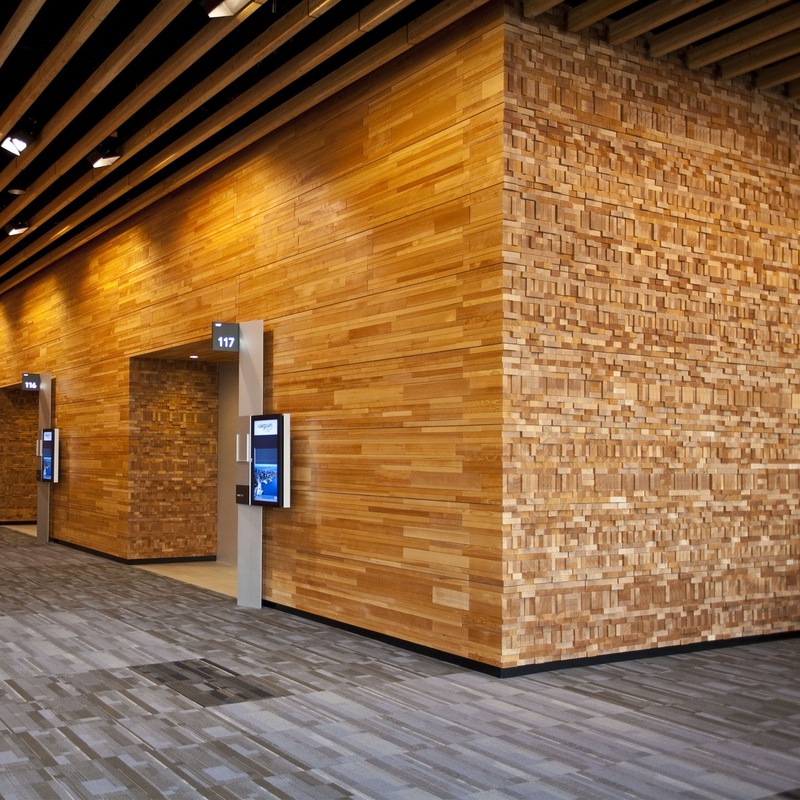 Wood, a traditional interior finish material, was used in a contemporary way for the Convention Centre. Douglas fir slats (harvested locally) run along the underside of the roof plane. Their lines help articulate shifts in slope, even from vantage points far outside the building envelope, since they are visible through the glass curtain walls. They also provide a sense of scale for large interior floor spaces below. 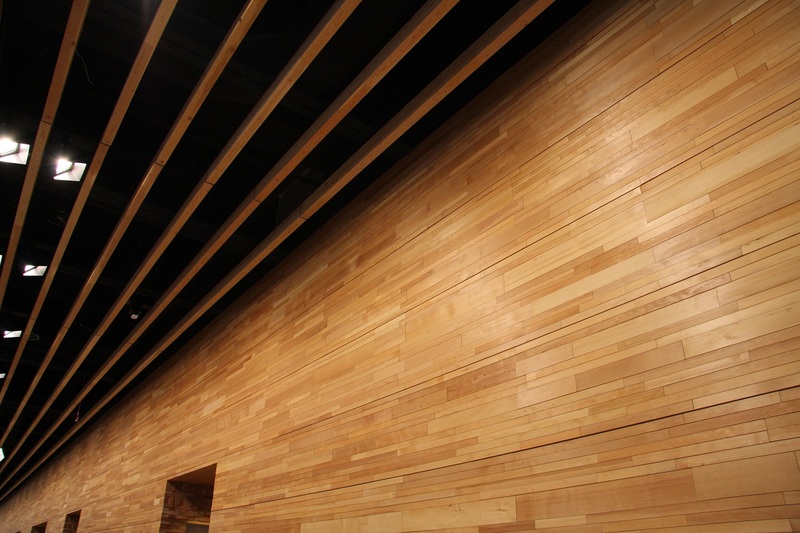 The dimensional characteristics of lumber are used to aesthetic advantage in some of the building’s wall surfaces. 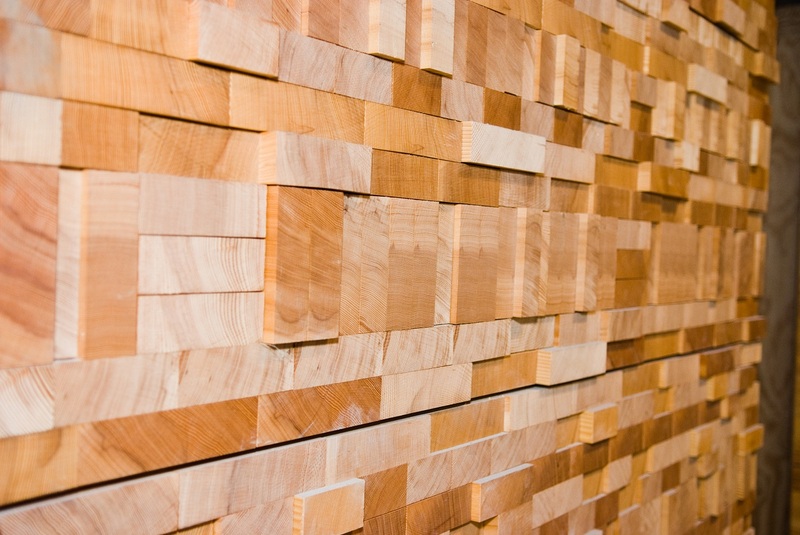 Hemlock lumber (also harvested locally) was cut into blocks and assembled into a textured, geometric pattern which was applied along the elevator corridor and other large public spaces. One of the most pressing concerns for a densely packed living environment is having enough green space. 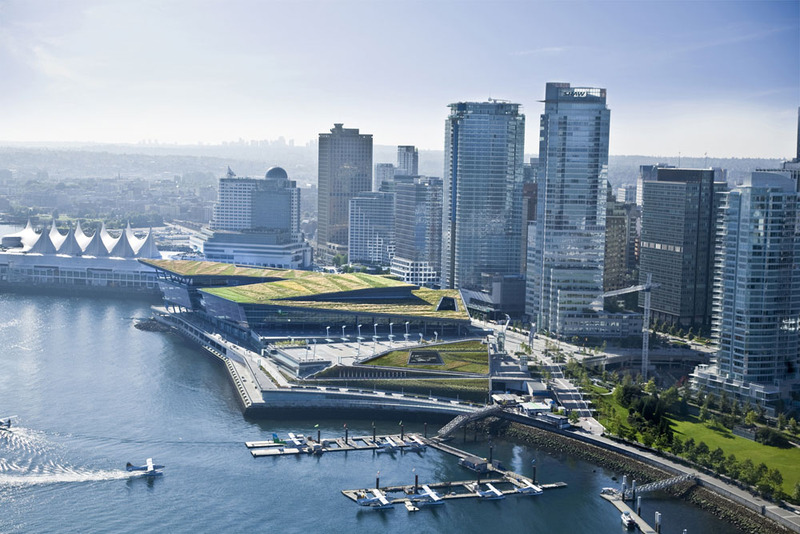 Vancouver has shown a history of progressive planning practices when it comes to setting aside green space and prioritizing ecological concerns, so the aspirations for the Convention Centre, which achieved LEED Platinum certification, didn’t change Vancouver’s overall direction. 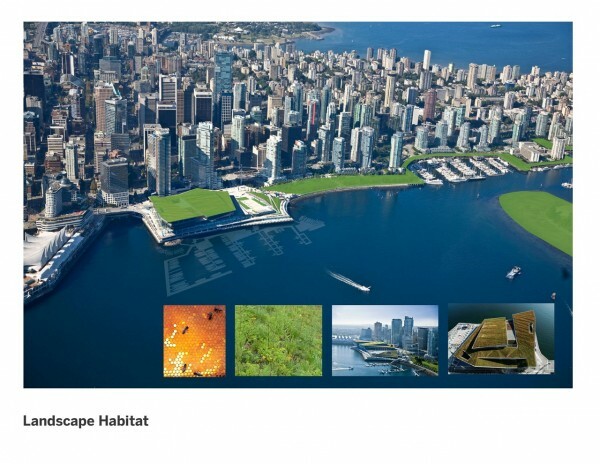 “Vancouver already believed in sustainability,” said Reddington. The building owner, BC Pavilion Corporation (PavCo), a Crown Corporation of the Province of British Columbia, was the initiator of the high green standards, according to Beaudreault. “They set the policy and design principles. They were adamant that everything that was incorporated into the building made sense for the building, and for the long term objectives of the building,” as opposed to perfunctorily fulfilling LEED requirements. 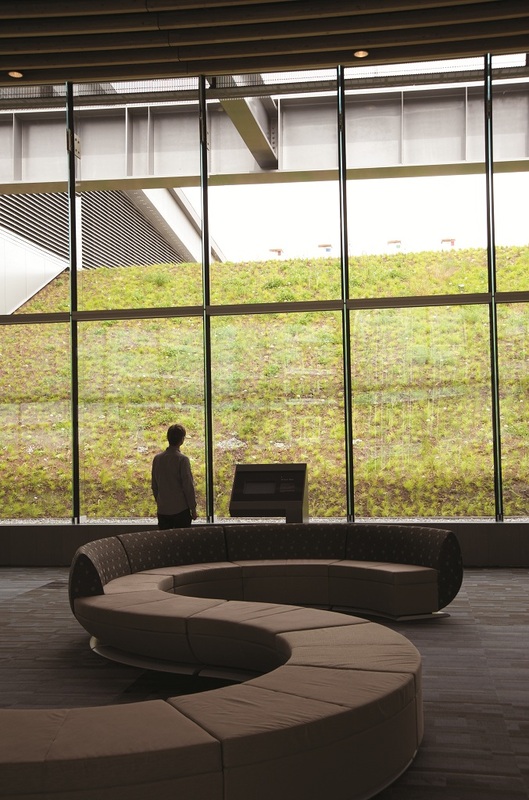 One of the most spectacular green features of the building is its six-acre living roof (the largest in North America). Since the building functions as an extension of the park system, acting as a link in the continuous waterfront ring of green spaces, this feature completely fits with the objective of the building. It is home to an impressive 400,000 indigenous plants as well as several hives of bees. 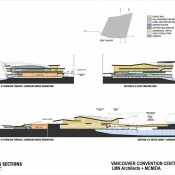 The distinctive form of the Convention Centre took shape in response to interior requirements as well as to outside influences. It accommodates a variety of programmatic functions, including one million sq. ft. of convention space (with exterior plazas and walkways, a ballroom, meeting rooms, and exhibition space), 90,000 sq.ft.of retail space, and parking, so “the geometry of the roof tried to do a couple of things,” said Reddington. "The ballroom needed to be big and tall. Other interior spaces needed to be smaller in scale, with lower ceiling heights. 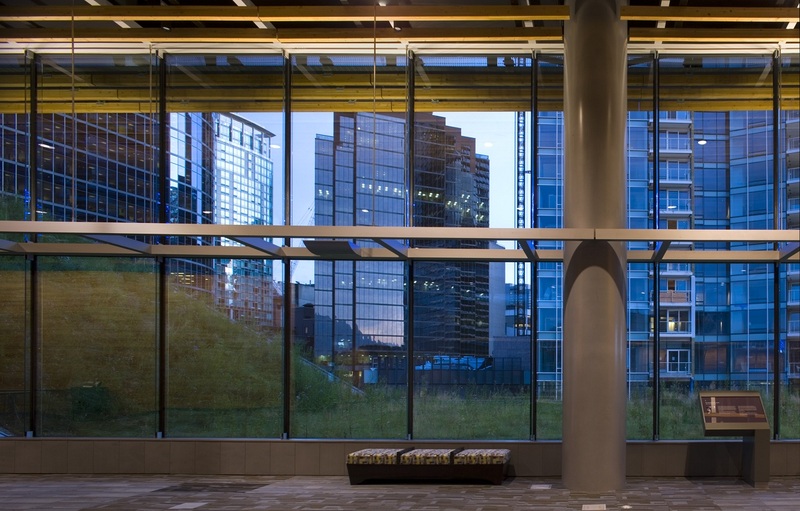 The lobby needed to frame multiple views.” Ultimately, LMN arrived at a building shape that included sloping roof planes. 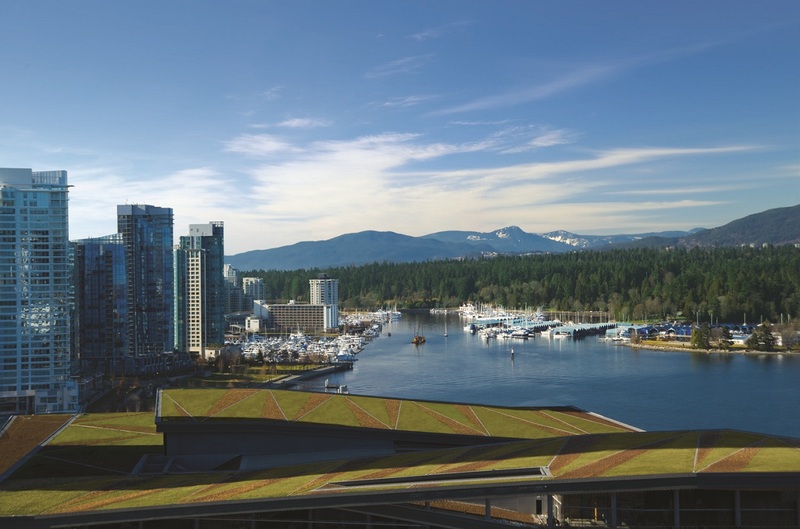 “The shapes are an extension of the ground plane, reflecting the topography of the region, and they help the building blend into the waterfront. 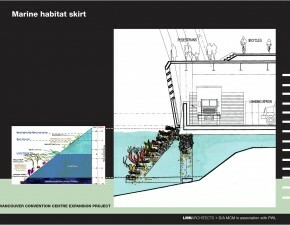 The existing habitat provided the parameters for the slopes,” Reddington said. To provide continuity between its interior and exterior, the entire building perimeter is glazed. 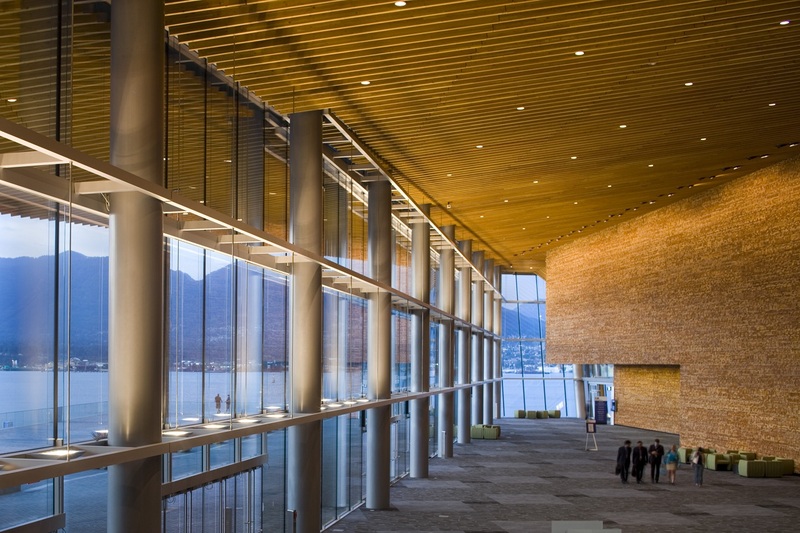 “To make this possible,” said Reddington, “lobbies and other public spaces occupy the outside of the building footprint; more private zones are located at the core of the building.” To avoid visual disruption, Beaudreault said, “For the curtainwall, instead of aluminum mullions, we used glass fins for structural support so that the views out to the water and to the mountains beyond would not be obstructed.” This transparent boundary helps tie in the 400,000 sq. ft. of walkways, bike paths, and open spaces that the center provides beyond the building envelope. 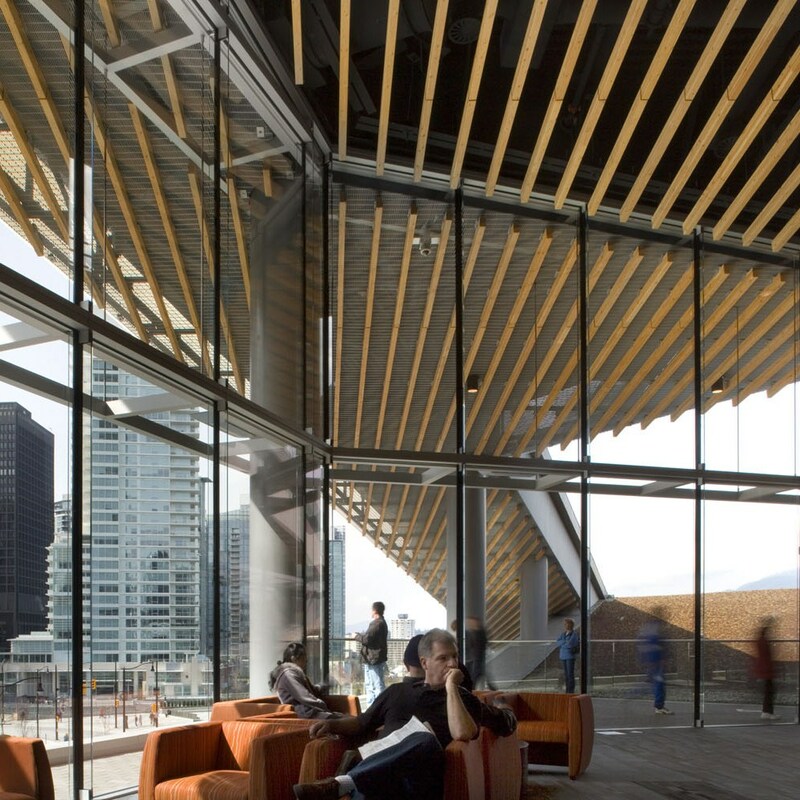 Natural ventilation and extensive daylighting not only contribute to the building’s sustainability goals, but also enhance the user experience. The generous amount of glazing which admits natural light into the space required particular attention in its detailing, especially to ensure its durability. Ecological considerations weren’t limited to concerns above the water line. 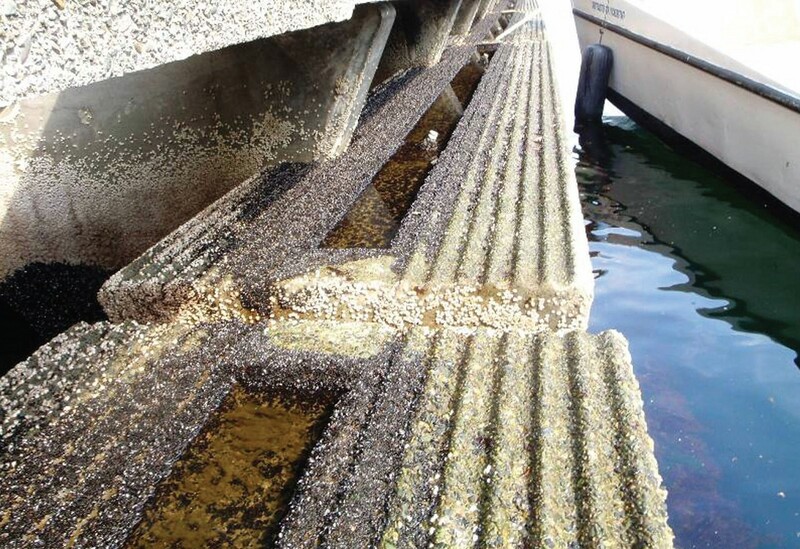 Along the waterfront, an artificial reef shelters salmon, crabs, starfish, seaweed, and other marine life. 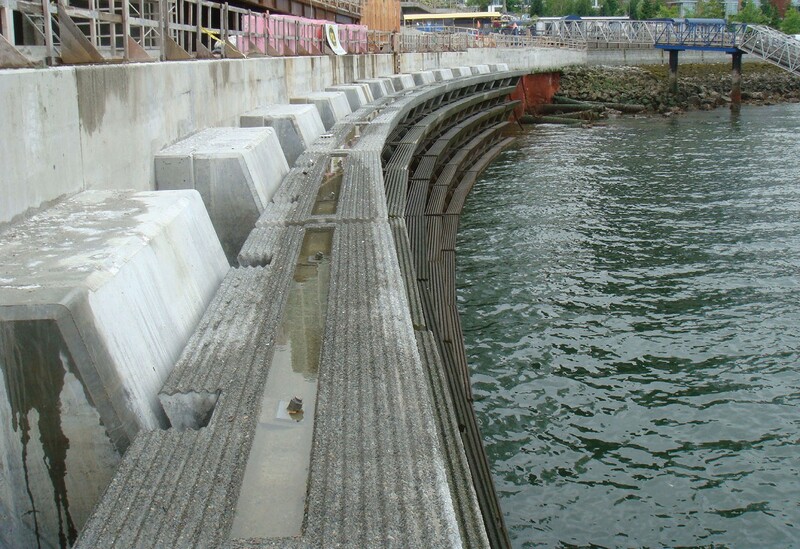 The concrete skirt steps down in five tiers from the underside of the public walkway into the harbor. Tides cause seawater to flush the area daily. 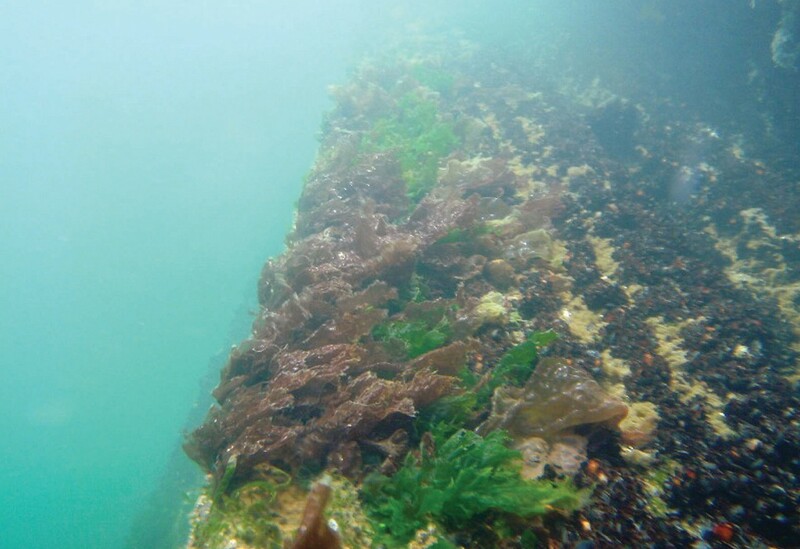 The skirt was designed with input from marine biologists and other consultants to make it mimic a natural environment, and plans were put in place to restore the habitat of 200'-0" of contiguous shoreline. The project’s utility systems feature some cutting-edge sustainability elements. Potable water use has been reduced by 60 to 70 percent over typical convention centers by taking black water -- the building’s own sewage water -- and treating it sufficiently to make it usable for gray water applications (e.g., irrigation during the dry season, toilet flushing, etc.). In fact, over 80 percent of the building’s gray water needs are met in this way; a 10,000 gallon storage tank is constantly being replenished. The center also has a desalinization plant on site, which draws water from the harbor and processes it to meet additional non-potable water demands. According to Beaudreault, the building’s mechanical system actually surpassed initial expectations in terms of sustainability. 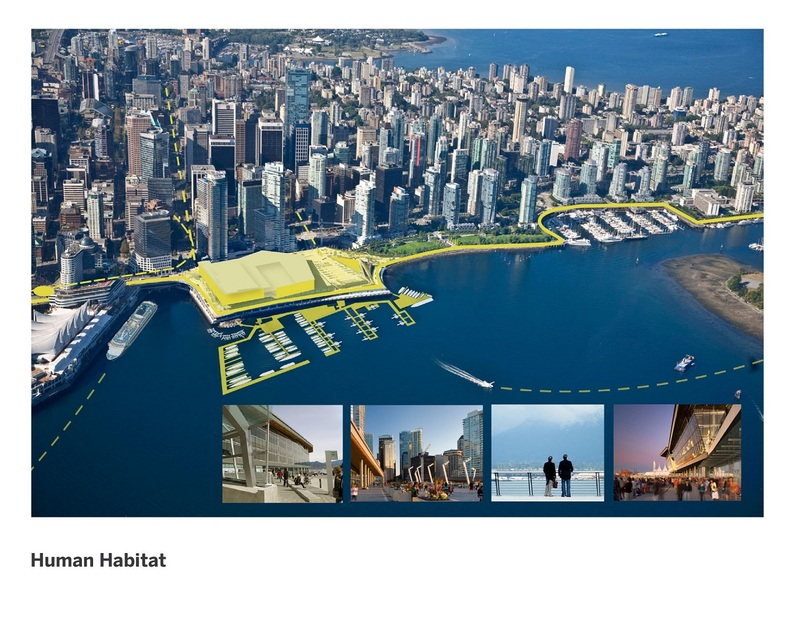 Said Beaudreault, “The original mechanical plan was to extend Canada Place's plant to heat and cool the new addition, but that didn't work out financially. So we designed a new mechanical system, using seawater cooling/heating through heat exchangers. We ended up with our own plant, and hadn’t originally planned for square footage for a mechanical plant, so that was a problem to solve. 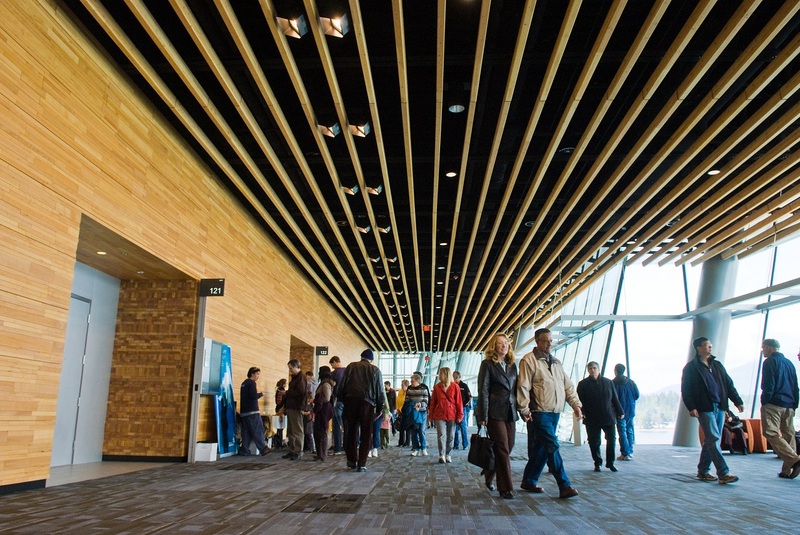 It threw us a curve ball.” The system used is similar to geothermal technology, except that a heat pump pipes water from the harbour, and it is the constant temperature of seawater that is used to heat and cool the building. In very cold weather, steam augments the heating system. Demand on the mechanical system is also reduced by the living roof, which acts as an insulator. For additional information on the utility system download the plumbing floor plan, courtesy of Musson Cattell Mackey Partnership. 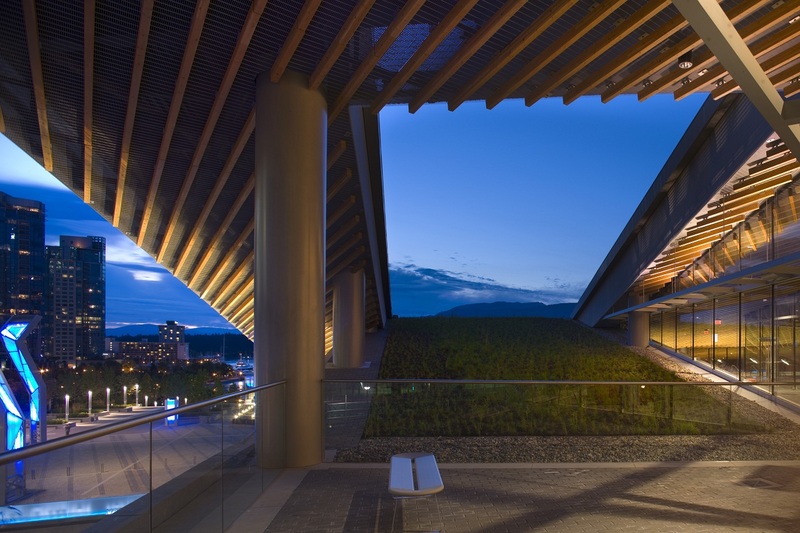 A gleaming jewel with a fuzzy top, the new LEED Platinum certified Convention Centre West is an affable mingling of glass, wood, and steel under an expansive natural land form green roof. 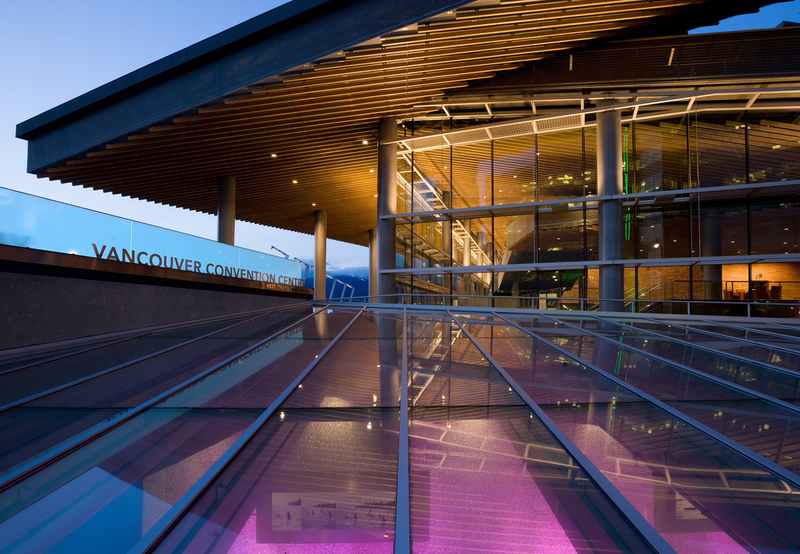 The long-awaited expansion to Vancouver's convention and exhibition facilities opened in April 2009, responding to the ever-growing demand for convention and exhibition space in Vancouver. The heart of the structural solution proposed in the earliest work was to be regular bays of multi storey trusses, some nearly 100 ft tall, and beams anchored to eccentric braced bays for seismic resistance. 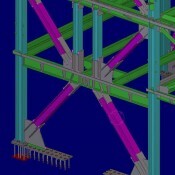 Image 1: One of the Tekla 3D steel models prepared in the design office of Glotman Simpson for design, visualization, materials tracking, tender & coordination. 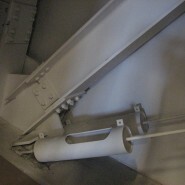 Model was given to the steel fabricator for their use in commencing the shop drawing model. Image 2: Eccentric Brace Bay Anchorage for seismic resistance - Tekla image. 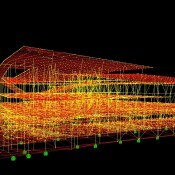 Read more about BIM technologies. Early estimates of steel quantities at conceptual design were within 5% of final built quantities in this 17,498 ton steel building covering approximately 420,000 square meters of irregular unique structure tailored to building usage. Success of coordination and speed of steel delivery is owed to using Tekla steel detailing software in the engineering office to prepare the project for tender. 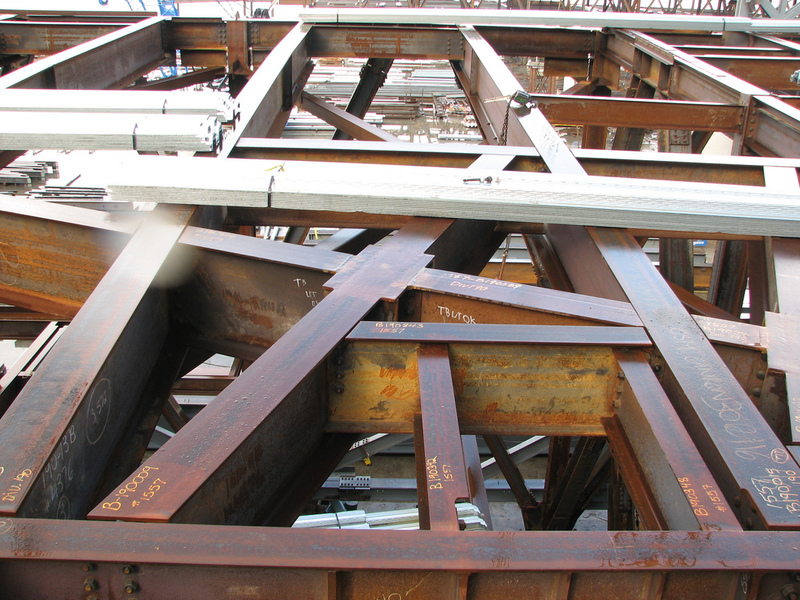 The “BIM” process developed by Glotman Simpson with Canron Western Contractors encouraged quick paperless review of steelwork allowing fabrication to proceed quickly and the project team to remain informed and involved. 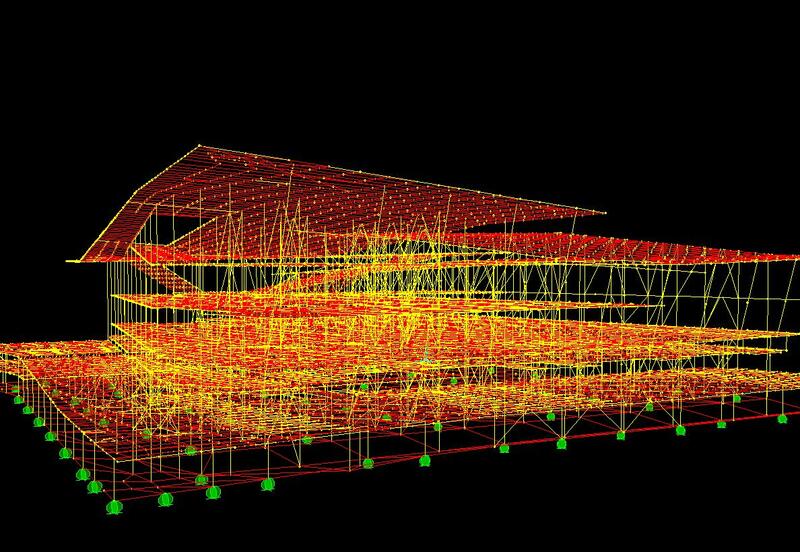 The design Tekla model accepted architectural Revit 3D input solving the geometric challenge of sloped and irregularly shaped building forms. 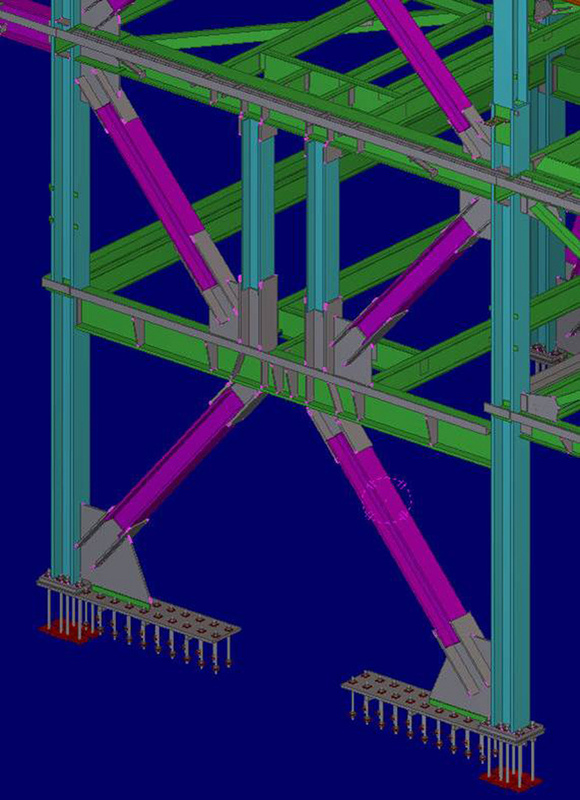 Tekla input into SAP2000 for structural analysis maintained accuracy and ensured reliable design. Visualization provided by these procedures illuminated both design opportunities and potential problems ahead of fabrication. 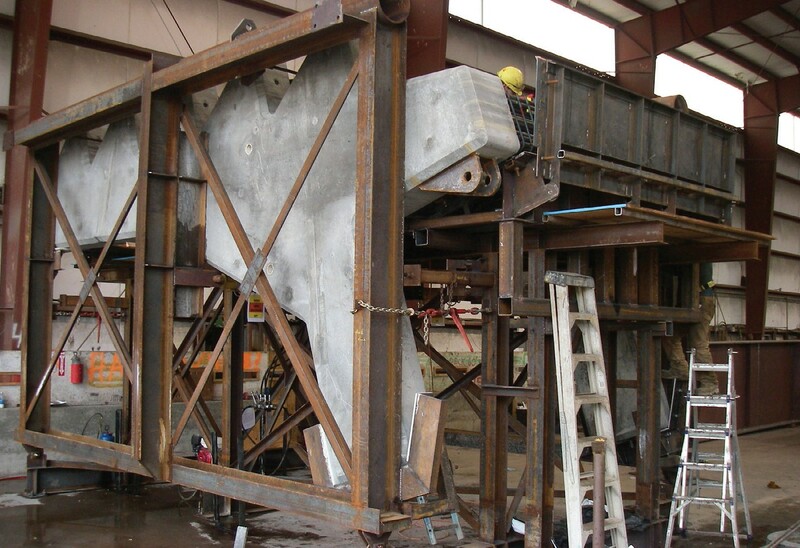 Materials tracking through design and fabrication allowed full utilization of pre-purchase steel and maintenance of budgets. To accommodate up to 15,000 visitors at once, with capacity for 5,000 people for dinner, large spaces and open volumes of building were indispensable. To avoid blocking the view of residents in nearby high-rise buildings, the roof height was restricted, leaving minimum depth for structure. To optimize depth and achieve long span with heavy loading, a unique layout of multiple story-deep trusses was used to accommodate door openings and passageways suitable to the building function. 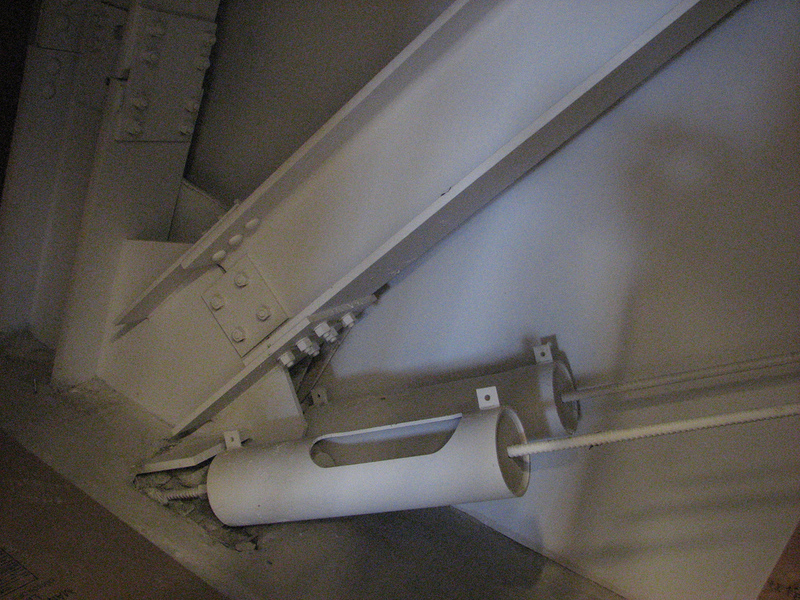 Braced bays have very heavy force transfer to the marine deck. Glotman Simpson required steel templates for all anchor bolts, and heavy anchor systems to be cast into the marine deck. Leaning columns provide an interesting challenge in a seismic region. Glotman Simpson devised a solution to not only solve the problem in a new and unique way, but also to provide a bonus contribution to seismic safety at the same time. 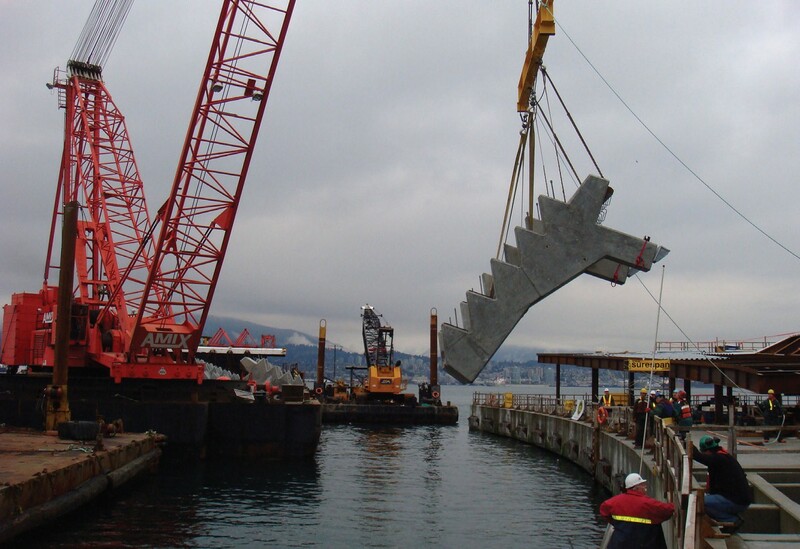 Eccentric braced bays were chosen for lateral load resistance but like all steel bracing systems they need to be free to yield equally in each direction to dissipate seismic energy and allow flexibility without failure. Gravity induced lateral forces from leaning columns at 27% of the gravity load are substantially greater than the associated seismic forces and would cause progressive yielding in only one direction -- an unacceptable result in seismic loading. To solve the problem, Glotman Simpson devised a UNIQUE diagonal brace with a linear spring composed of a series of disc spring washers that could sustain the leaning column lateral forces and yet allow movement without becoming fully taut or loose at each end of the sway. While perfectly balancing the load (confirmed by test), the brace force increases as the building sways toward the leaning column direction and reduces when the building sways opposite. The variation in sway force provides a net correcting force serving as a self centering seismic resisting mechanism for the building. The brace, acting independent of the seismic eccentric braces, allows the eccentric braces to function effectively and, additionally, provides a self centering force to improve the performance of the building. 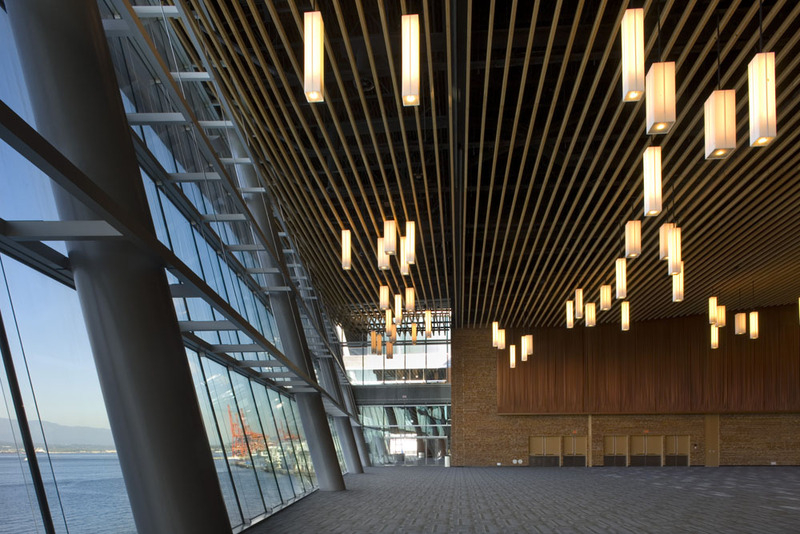 Self centering technologies are some of the newest research topics in the seismic area today and the new convention centre can now benefit from a self centering solution unique in the world of buildings. Patent applications are in process on this technology. 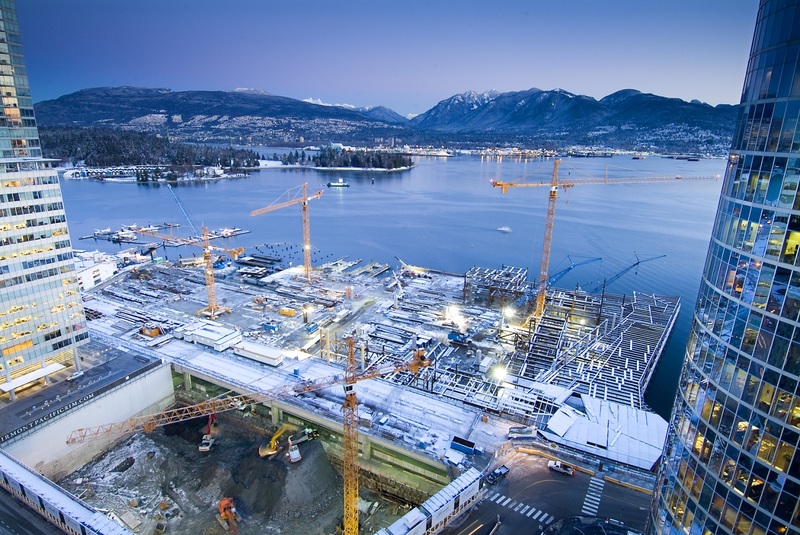 Glotman•Simpson is one of North America's premier structural engineering firms. We offer our clients leading-edge structural solutions in the areas of commercial, institutional,industrial and residential design. 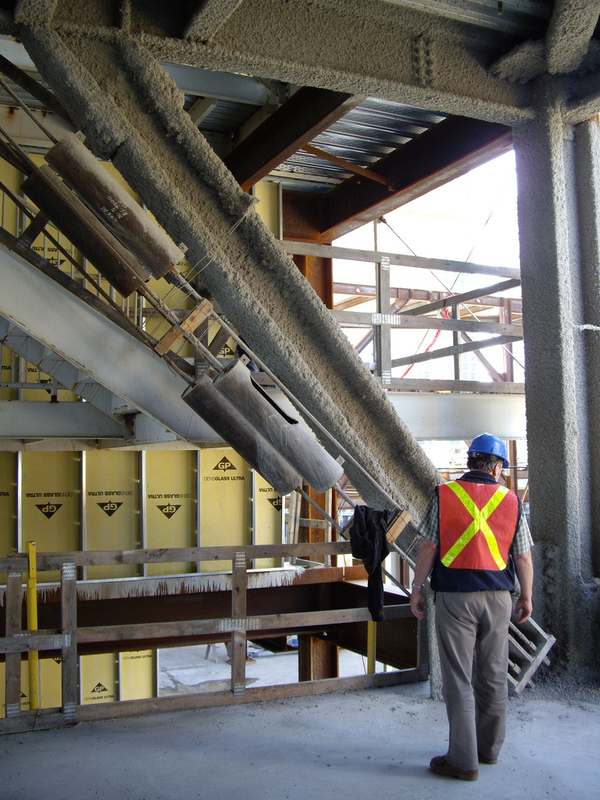 With over 4,000 projects completed in the last 45 years, we have proven our ability to provide innovative and cost effective answers to the most complex structural problems. Creative Thinkers, Cleverly Disguised as Engineers. 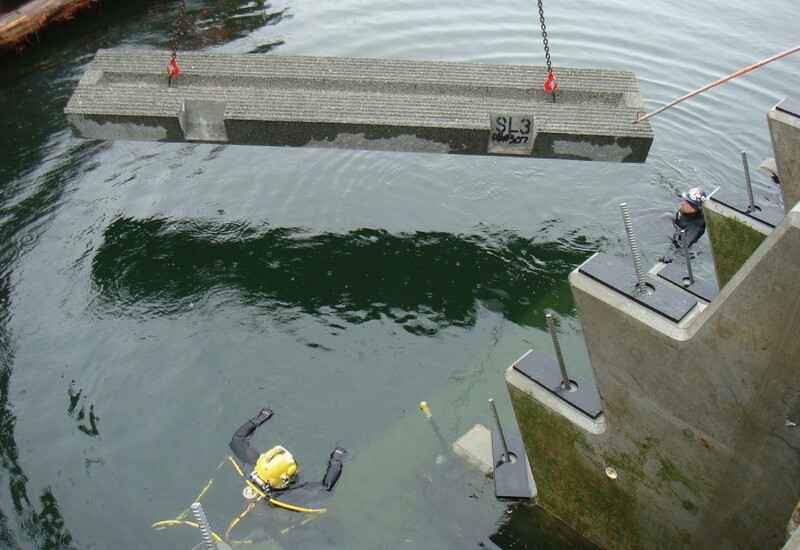 For additional Glotman Simpson projects click here.